China Foreign Teacher News, Updates, & Scam Alerts: Almost 3,000 foreign employees arrested and deported from China in 2016 - Almost 90% were foreign English TEFL & ESL teachers who accepted illegal jobs from blacklisted agents. 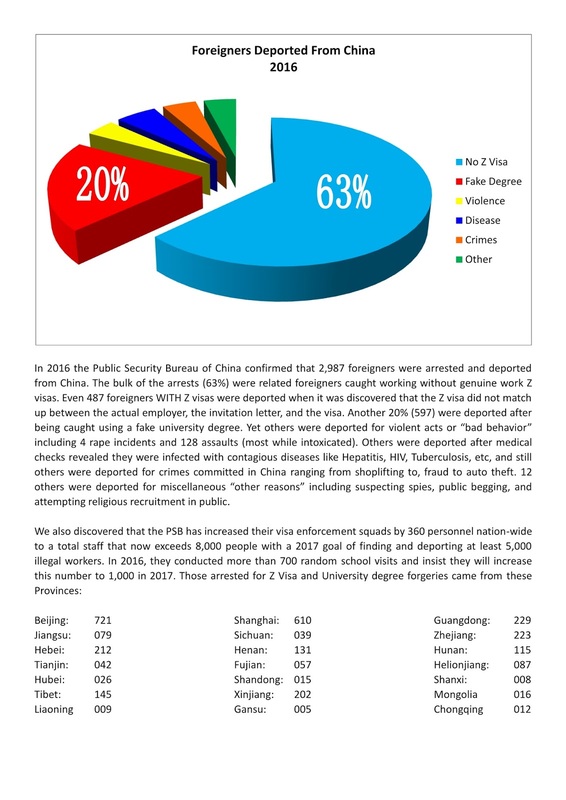 Almost 3,000 foreign employees arrested and deported from China in 2016 - Almost 90% were foreign English TEFL & ESL teachers who accepted illegal jobs from blacklisted agents. * In 2012, only five years ago, less than 1,000 foreign teachers were expelled from China, only one-third of the current number. Back then teachers caught working without a Z visa were simply warned or fined. Today they are booted out after spending 30 days in jail, paying a $2,000 and sent home as a convicted felon with a 3-5 year reentry ban. Most will never be able to get another travel visa the rest of their lives because they are now tagged as "illegal migrant worker" and "convicted felon" in the many databases of global law enforcement. * In 2016 the PSB conducted more than 2,000 random visa check visits in 27 Provinces compared to only 827 in 2014 in six Provinces. Clearly they have expanded their hunting grounds. * PSB undercover agents have resorted to posting over 1,600 known sting job ads in thebijinger.com, echinacities.com, eslcafe.com, gumtree.com, sinocities.com, and craiglist.com. At first, their bad English gave them away, but in 2016 they must have hired foreign proofreaders because now the ads are undetectable. The PSB claims over 700 foreigners using fake diplomas and illegal visa were caught in their sting operations in 2016. * The PSB obtained a 6% budget increase to expand their visa enforcement operations in 2017 and are now hiring and training 745 new visa enforcement officers and 210 special investigators to help grow their sting ops. * 2016 was the first year that the PSB actually started to jail the black agents and recruiters caught selling fake diplomas and TEFL certificates and/or telling new arrivals to China it was okay to work without a Z visa. Arrested agents were given a choice to pay a 100,000 yuan fine and turn over their phones and hard drives to the PSB (to find and entrap more illegal teachers working in China) or go to prison for 6-12months. * The PSB increased their public reward from 5,000 rmb to 10,000 rmb to informants who provided information leading to the arrest of illegal foreign workers. One TA we know of earned over $80,000 in just one year snitching out expat workers her boss sold fake university degrees to. More details are found here: https://eslwatch.info/en/forum/china/76-china-foreign-teachers-unite-report-fake-unqualified-teachers-to-the-psb.html?start=30. Our source at the PSB said that roughly 20% of the informants work at the same school as the teachers they reported, which is a bit disturbing in our opinion. 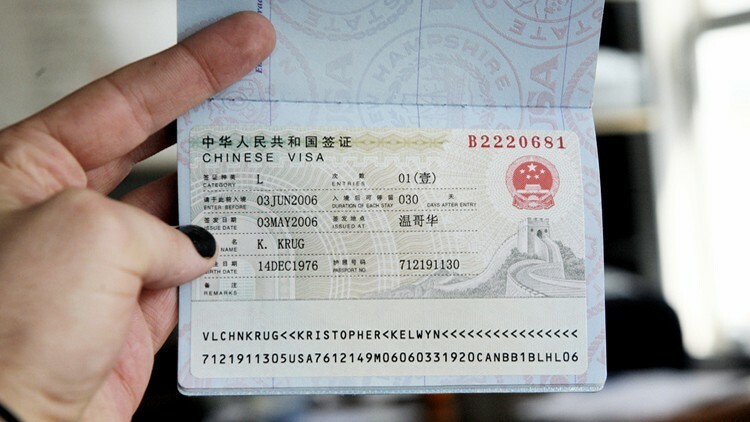 Working on an F, M, or L Visa like the one below can get you arrested and jailed on the spot in China, no matter what your job recruiter told you! I am concerned that my company hires tourists, and places them in schools. I have work Visa, foreign expert certificate, resident permit. I feel I am completely legal, I even have Chinese lessons with local Foriegn Expert Officer, as he learns English. However, I worry that company is not the best, and could be shut down at any time , I would lose airfare, and 2 months salary, they pay a full month late. Is it possible to get a working visa in China as a teacher if I am a convicted felon who has fully paid his debt to society?